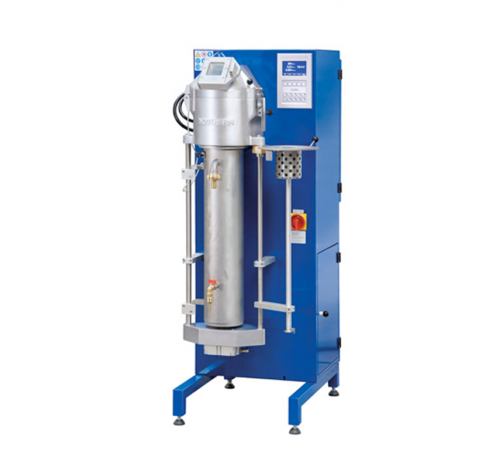 GU-500 Indutherm These machines are developed especially for granulating of metal bullions into proper grains. They are used with a separate removable granulation tank (no tank integrated) and are available with crucible sizes from 170 ccm up to 12000 ccm. The major applications are Preparation of alloys out of gold and master alloy… Preparation of alloy components… Preparation of alloys from components… Cleaning up of already casted metal… …under inert gas atmosphere or under vacuum Major applications at customer: Granulating of metal bullions into proper grains Preparation of alloys out of gold and master alloy under protecting gas atmosphere or under vacuum Cleaning up of already cast metal under protecting gas atmosphere or under vacuum Major advantages: Excellent mixing of molten metal due to low frequency generator Melting under protection gas atmosphere or vacuum Alloy mixing because of sealing rod system Automatic protective gas control Turbo – pressure device for cleaning the complete crucible 16 temperature programs Stainless steel granulation tank with pneumatic lift Easy emptying of the granulating tankData:Dimensions ———–500 x 1400 x 820 mm (W x D x H)Weight —————- 120 kgPower max. / electrical connection –10 kW / 3 x 400 V 50 A, 50 or 60 HzMaximum temperature —————1600° CTemperature measurement —–up to 1300° C N type or 1600° C S type thermo coupleCrucible volume —-245 – 386 ccm ~ 3.6 – 5.7 kggoldFlask —–max. ⌀ 130 mm / 260 mm hSupply: inert gas argon or nitrogen -Yes – at 1.5 to2.0 bar pressureCooling water supply —-2.5 – 6 bar/ at least 200l/hVacuum (optional) —0-20 mbar max., at least 21 m³/h ..
granulation tank (no tank integrated) and are available with crucible sizes from 170 ccm up to 12000 ccm.